The TeleTrac 2200 is a rugged track-style self-propelled pipeline inspection camera. 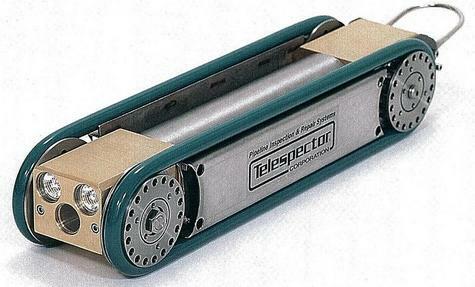 It is capable of inspecting pipelines from eight inches (8" - 200mm) I.D. to thirty inches (30" - 800mm) I.D. by varying the track width and height which is easily performed by adding the appropriate size wheels and spacers supplied with the tractor. Enclosed within the tractor housing is a high resolution, low light CCD color camera featuring a super wide angle lens and two (2) high intensity, field-replaceable multi-faceted reflector (MR) lamps. Built from high-quality corrosion resistant materials like stainless steel and naval bronze the TeleTrac 2200 is completely water-tight and pressure tested to 30 psi. Pressure testing is easily performed in the field from the air test/fill valve located at the rear of the tractor. The heavy-duty drive train of the TeleTrac 2200 includes a high torque 90VDC PM motor directly coupled to a multi-stage planetary gear reducer. A unique bi-directional automatic clutch allows the drive axles to freewheel whenever the TeleTrac 2200 is moved manually in either direction. This feature facilitates easy retrieval in the event that the power is disconnected. It also prevents cable entaglement when moving in reverse and if necessary allows the tractor to be pulled through the pipeline by a winch.